Brown, John Russel. Multiplicity of Meaning in the Last Moments of Hamlet. Calderwood, James L. Madplay, Wordplay, Inner-Play. Freud, Sigmund. on Hamlet from The Interpretation of Dreams. Jorgensen, Paul A. Hamlet and His Problems. Pasternak, Boris on Hamlet from I Remember. Also these selected short essays on Hamlet. Donaldson, Peter. Olivier, Hamlet, and Freud, 1987. Knowles, Ronald. Hamlet and Counter-Humanism, 1999. Goddard, Harold C. Hamlet to Ophelia, 1955. Kemp, Lysander. Understanding "Hamlet," 1951. Brecht, Bertolt and Bonheim, Helmut W. Hamlet, 1957. Ornstein, Robert. Teaching Hamlet, 1964. Hellenga, Robert R. Hamlet in the Classroom, 1973. Skulsky, Harold. Revenge, Honor, and Conscience in "Hamlet," 1970. Berry, Ralph. Hamlet's Doubles, 1986. Hatcher, O.L. The Ur-Hamlet Problem, 1906. Croxford, Leslie. The Uses of Interpretation in Hamlet, 2004. Stephenson, Henry Thew. The "Spanish Tragedy" and "Hamlet," 1906. Michael Benton's and Sally Butcher's Painting Shakespeare, published in 1998 in the Journal of Aesthetic Education. Beggarstaffs poster of Hamlet from 1894. Franz Peffer's poster of Hamlet from 1920. Malczewski's A Polish Hamlet, painted in 1911. Manet's 1877 painting of Jean Baptiste Faure as Hamlet. Eugene Delacroix's Hamlet studies are very interesting and important, for a good analysis of them I would suggest reading Robert I. Edenbaum's Delacroix's "Hamlet" Studies, published in 1967 in Art Journal. Ophelia and Hamlet (1883,1884) by Mikhail Vrubel. The three different paintings of Ophelia (1889, 1894, 1910) by John William Waterhouse. Ophelia by Antoine August Ernest Hebert from 1877. Herbert Child's essay On Elizabethan Staging of Hamlet. James Thomas writes about the 1884 production by Wilson Barrett. Paul Hadfield reviews Michael Bogdanov's 1983 production of Hamlet at the Irish National Theater, a production with a "pronounced Marxist thrust." A theater report on the 1981 Mickery's production of Hamlet. Kanadehon Hamlet: A Play by Tsutsumi Harue. The 1970s-1980 Soviet production of Hamlet starring Vladimir Vysotsky. Actors as Hamlet on stage and screen through the ages. M. Burnett's article about Michael Almereyda's take on Hamlet (2000). The 1964 Soviet film production of Hamlet by Kozintsev starring Smuktunovsky. MLA: Pogrebinsky, Alexander A.. "Hamlet: A Research Guide." Hamlet Guide. www.pogrebinsky.info, n.d. Web. day month year. <http://www.hamletguide.com/>. APA: Pogrebinsky, A. A. (n.d.). Hamlet: A Research Guide. Hamlet Guide. Retrieved Month, day, year, from http://www.hamletguide.com. Chicago Style: Pogrebinsky, Alexander A.. "Hamlet: A Research Guide." Hamlet Guide. 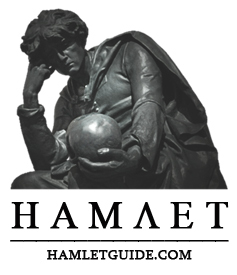 http://www.hamletguide.com (accessed month, day, year). © All Rights Reserved. All materials published on this site are for the sole purpose of course-related, non-commercial, educational and academic use. No materials may be published or reproduced for-profit. Hamletguide.com is a not-for-profit website dedicated to offering educational resources for students and academics.